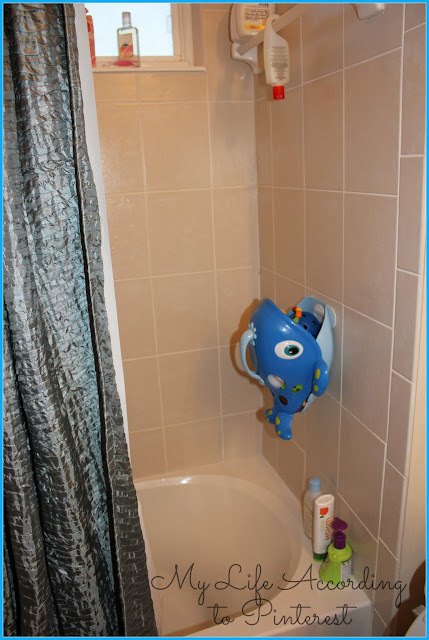 Nuby's Whale Pail Sea Scooper is the BEST bath toy holder I've ever used! It's big, so it holds a lot of toys. It has plenty of drainage, so toys actually dry out after bath time. The hook really holds the Sea Scooper in place. Plus, it's cute and colorful! 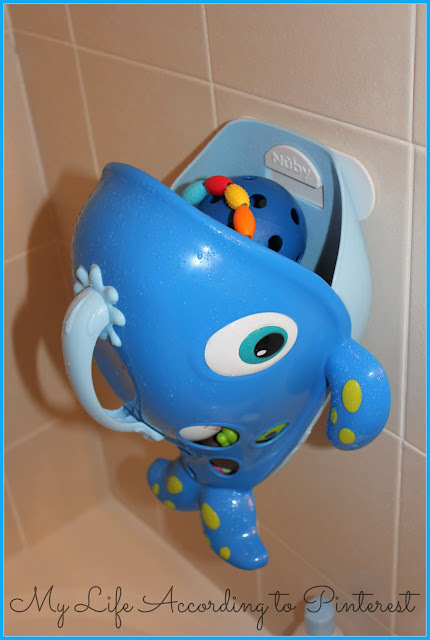 From Nuby: Make bath time more easier and more enjoyable with the Nuby Whale Pail Sea Scooper! After bath time fun is over, Nuby's Sea Scooper makes cleaning quick and easy. Watch your baby giggle with delight as you scoop you favorite bath time toys into the whale's tummy. The pail has special drain holes built in allowing excess water to easily drain away from the toys and quickly air dry. Equipped with easy installation wall hooks, Nuby's Sea Scooper keeps bath time toys neatly on the bathroom wall. Unfortunately, the Sea Scooper wasn't my first bath toy holder. I previously had another brand of toy holder that suctioned to the wall. Well, it was supposed to suction to the bath wall, but is usually didn't. The darn thing fell off the tub wall at least once a week sometime between 10 p.m. and 1 a.m. crashing in the bathroom and scaring the bejesus out of me every time! After the third late night scare I had had enough and trashed it. That's when I got the Nuby Sea Scooper. I LOVE the way this attached the the tub wall so easily! It came with the hook. I peeled off the tape and stuck it where I wanted it on the shower wall, waited about 30 minutes and started using it. It couldn't have been easier and it has NEVER fallen off the wall- even full of toys every night! After bath time I fill the Sea Scooper with all the wet bath toys (and it's big, so it holds a lot of toys) and I've never come back the next night to still wet toys. Even the cloth pool balls that my little guy plays with in the tub dry out in the Sea Scooper due to it's great drainage holes. This is great to use to store and scoop up pool toys too! Buy It: You can buy Nuby Sea Scooper Whale Pail at buybuybaby.com, bedbathandbeyond.com, amazon.com, and Bealls. Win It: Thanks to Nuby, one lucky person is going to win a Sea Scooper of their own! Giveaway is open to U.S. Ends 8/6 at 11:59 p.m. E.S.T. I like Nuby cups and the solid feeding items. My favorite Nuby product is the iMonster Feeding Set. I love all Nuby products, but my favorites are the cups! We have a bug teething ring that's always been a favorite. My favorite product is their potty training seat! I love how secure it is on the tub wall but can be transported around when needed. Great review! I love their Step Up Stools! My favorite are the step stools. I love all their products though.